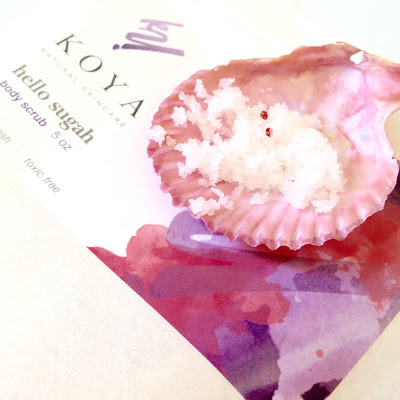 That "Hello Sugah" title certainly got my attention, much like these Koya Natural Skincare flat pack body scrubs with fun names like Hello Sugah and Beach Babe. 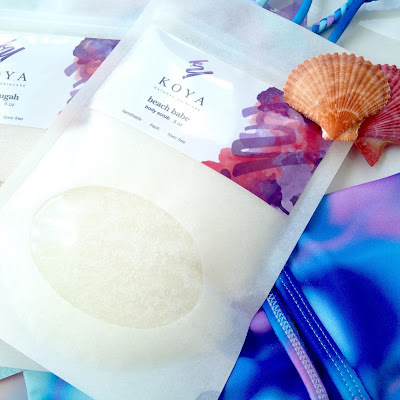 Koya was kind enough to send me the latest additions to their natural body care line. Although they already were selling a Javalicious coffee scrub and a Sugah Sugah whipped sugar scrub in the standard round container, they opted to make more travel-friendly versions in reusable, resealable bags. ... it turns into a crystal sand-like texture with tiny specks of pink. It smells fruity and yummy, much like the cranberry in this unique scrub. It's the perfect end of summer treat. The ingredients in this scrub are coconut oil, sugar, salt, macadamia nut oil, cranberry seeds and aroma. To use it, simply pour out your desired amount (I like to put some in a separate container to bring into the shower with me, so the rest of the product does not get wet), apply it to dampened skin and rub it in a circular motion all over your body. For best results, allow the product to on your skin for a few minutes before rinsing it away. ... and don't forget to put some in a separate container before taking it with you to the bath or shower. You'll need more than you see here, but you get the idea. Koya advises that you keep the original bag sealed and stored in a dry place to keep the product fresh. This is a handmade, cruelty free, natural product that needs to be used within 6 weeks of opening, as it does not contain any preservatives. The ingredients in the Beach Babe scrub are much like the Hello Sugah scrub, but with coconut flakes and jojoba oil, rather than cranberry seeds. As a result, it smells like coconuts at the beach, although it looks a little like snow (these would make excellent holiday gifts). 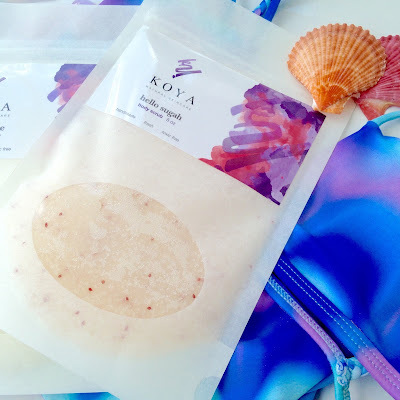 Both of these scrubs really exfoliate well, especially since they are not partially dissolved in oils like a traditional scrub. There is just enough moisture to make the sugar particles stick to your body long enough to get the job done. It also washes away easily and doesn't make a big mess in your shower. These scrubs left my skin moisturized without leaving any trace of oil for those of you who may be concerned about breakouts. I personally don't mind it, as I sometimes apply a dry oil when I'm done anyway, but I know some of you would be happy to know this. 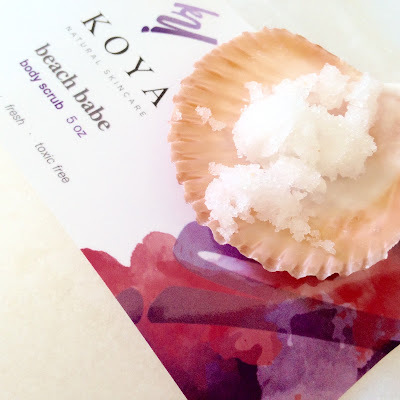 Do you use body scrubs? What are your favorites? Have you tried Koya Natural Skincare? Let me know on Twitter at @Rawdorable and/or on Instagram (also @Rawdorable). I'm a 40-year-old wife and mom who enjoys natural beauty, fashion, fitness, DIY, raw foods, spending time with my family and sharing my healthy lifestyle with others. Check out Lauren's Etsy page to find out how to purchase this "liquid gold"
Disclaimer: This site is for informational and entertainment purposes only. The author is not a medical doctor or trained nutritionist and is not responsible for any consequences regarding your use or intended use of any information provided on this site. Always check with your medical professional or trained nutritionist before making any changes to your diet or lifestyle regarding your health.